A storage shed is a great place to keep lawn maintenance materials, equipment, tools and other items. Building a shed can be as simple or complex as you want it to be, from a small shed for holding a few garden tools to a larger unit to house a workbench and a riding lawnmower. 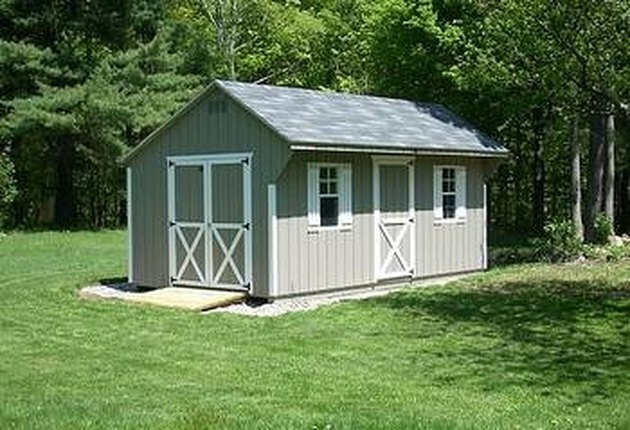 The simplest shed to construct is one made with wood on a simple foundation. However, all aspects of your project may depend on your local building codes. Obtain or draw your own building plans. Some sites for obtaining building plans are listed in the resources section below. This is the first step in determining how big your storage shed will be. If you are drawing your own plans, lay out all of the tools and equipment that you plan on storing in the shed to get an idea of how many square feet you will need. Windows provide free lighting and can eliminate the need for electricity if don't want it in your shed. Obtain a building permit if needed. You will need to check with the building-code department of your city or county to determine their requirements. Rural areas in some states do not have building codes, while many areas have no codes for buildings under a certain square footage. Prepare the site where you will build your shed. It is best to avoid low-lying areas where water collects when it rains. This can cause premature rotting of wood and mold and mildew in and on your structure. It is also a good idea to have the shed close to the house or garden where you will be using it the most. Install the foundation according to your plans or local building codes. In northern climates many codes require that you dig below the frost line to install a concrete block foundation. Towns in warmer areas usually do not have such a restriction. In such areas a simple floating foundation of pressure-treated 4-by-4 lumber or skids can be used directly on the ground or on concrete blocks. Select building materials that are suitable for outdoor weather. This includes the foundation timbers, exterior plywood or siding and roofing material. Traditional asphalt shingles can be used but galvanized metal roofing provides a longer-lasting alternative.